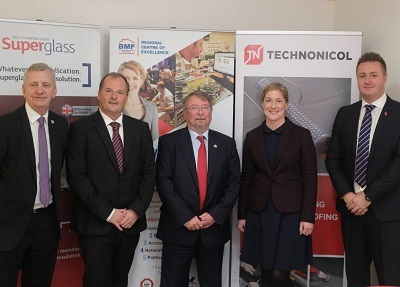 The BMF has launched its 22nd Regional Centre of Excellence (RCOE), and the third in Scotland, at Superglass Insulation in Stirling. The growing network of BMF Regional Centres of Excellence is making training courses and regional meetings more accessible to BMF members throughout the UK and Ireland. Superglass Insulation produces thermal and acoustic glass mineral wool products to exacting standards, evidenced by the recent £37m investment in state of the art manufacturing facilities which will double output at their Stirling base. The BMF’s latest RCOE is situated at the Superglass Futureworks Innovation Centre, a unique resource for architects and industry professionals alike. The 3,000 sq ft facility combines contemporary meeting space for up to 40 people with a comprehensive product demonstration area showcasing the latest products. For details of all the BMF Regional Centres of Excellence please visit www.bmf.org.uk/membership.